In organic chemistry, peptide synthesis is the production of peptides, in which multiple amino acids are linked via peptide bonds. In contrast the biological process of producing long peptides (proteins) is usually referred to as protein biosynthesis. The idea of linking amino acids to chain is over 100 years old but it took about 50 additional years to find solutions for occurring problems. Robert Bruce Merrifield (Order our Merrifield Resin ABIN1536402) pioneered the solid-phase peptide synthesis1. With SPPS it is possible to synthesize peptides with a length up to 50 amino-acids. The technology enables the synthesis of natural peptides which are difficult to express in bacteria, the incorporation of unnatural amino acids and to generate unique peptides to optimize a desired biological response or other result. 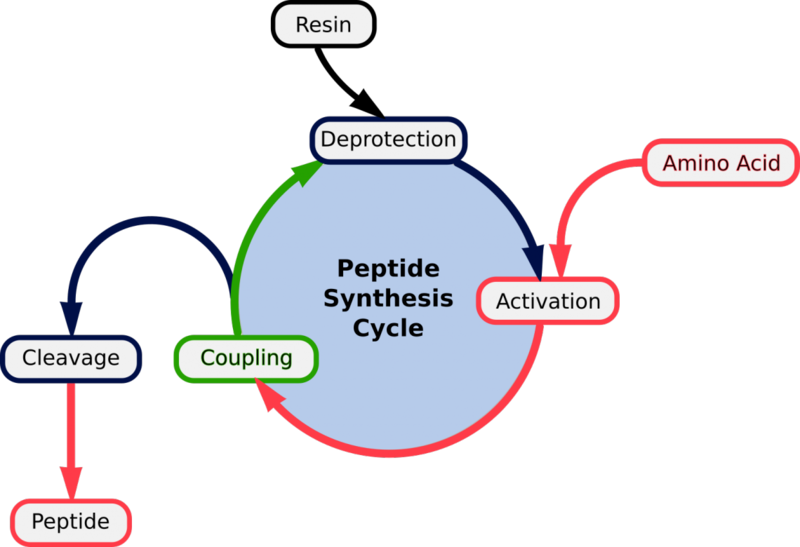 The invention of peptide synthesis led to the development of different application areas in which synthetic peptides are now use, including the development of epitope-specific antibodies against pathogenic proteins, the study of protein functions and the identification and characterization of proteins. Furthermore, synthetic peptides are used to study enzyme-substrate interactions within important enzyme classes such as kinases and proteases, which play a crucial role in cell signaling. Finally, synthetic peptides are used as standards and reagents in mass spectrometry (MS)-based applications. To start the SPPS the C-terminus of the first amino acid is coupled to an activated solid support, commonly chemically unreactive polystyrol. The resin acts as the C-terminal protecting group, the immobilized protein can be retained during a filtration process while liquid-phase reagents and by-products of synthesis are flushed away. The general principle of SPPS is one of repeated cycles of deprotection-wash-coupling-wash (fig.1). The free N-terminal amine of a solid-phase attached peptide is coupled (see below) to a single N-protected amino acid unit. This unit is then deprotected, revealing a new N-terminal amine to which a further amino acid may be attached. Note: Browse our products at antibodies-online to choose between 60 different resins and scavengers out of our own brand antibodies-online™ or the well-known supplier Abbexa. If you have questions concerning the right product choice our team of scientist will gladly assist you via mail, live chat or telephone. Over the years many variants and improvements of SPPS have been developed exchanging chemicals to optimize for a certain application2. Different resins allow for different functional groups at the C-terminus. The Wang resin (ABIN1536454) and oxymethylphenylacetamidomethyl (PAM) resin results in the conventional C-terminal carboxylic acid3. On the other hand, the Rink amide and paramethylbenzhydrylamine (pMBHA) resin yields a C-terminal amide, which is useful in mimicking the interior of a protein. Fmoc (Fluorenyl-9-methoxycarbonyl) is an example for a base labile N α protecting group. Advantages are good acid stability, ultraviolet absorption which helps in monitoring and an easy preparation. Additionally side chains have to be protected as well to prevent the formation of branched chains. It should be permanent and compatible with Nα-protection however easy to remove with acid after completion of the synthesis. Compare and order our bead-based products! Figure 2. Functional and protecting groups in peptide synthesis. The act of removing protecting groups, especially under acidic conditions, results in the production of cationic species that can alkylate the functional groups on the peptide chain (fig.2). Therefore, scavengers such as water, anisol or thiol e.g. (MP-Thiosulfate Resin (ABIN2953648)) derivatives can be added in excess during the deprotection step to react with any of these free reactive species. R. B. Merrifield: "Solid Phase Peptide Synthesis. I. The Synthesis of a Tetrapeptide". In: J. Am. Chem. Soc., 1963, (14): p.2149–2154. Moss JA: “Guide for resin and linker selection in solid-phase peptide synthesis.” In: Curr Protoc Protein Sci., 2005 Jun;Chapter 18:Unit 18.7..ps1807s40. Wang, S.-S.: "p-alkoxybenzyl alcohol resin and p-alkoxybenzyloxycarbonylhydrazide resin for solid phase synthesis of protected peptide fragments". In: J. Am. Chem. Soc., 1973, (4): p.1328–33.